I love butternut squash. I love it mashed, grilled, roasted. I love it in risotto. 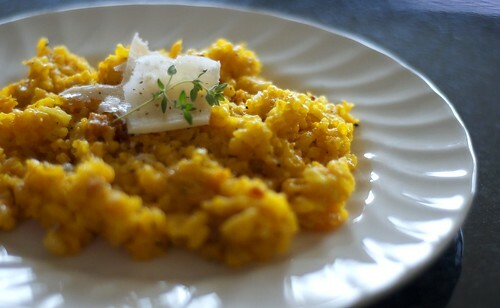 More specifically, I love it in this risotto. Combined with pancetta or bacon lardons (I actually prefer the latter), Parmesan cheese and a beautifully creamy stock this tastes awesome. I made this for my mom just before Christmas and ever since then she’s been asking me to make it for her constantly. I’ve made it for dinner parties and quiet dinners. Try this one out, it’s awesome. 2. Coat the cubed butternut squash with olive oil and a good grind of salt and pepper, then roast on a baking sheet for 20 minutes. When cooked puree half the butternut squash. 3. In a medium sauce pan over a medium heat pour chicken broth and cream and simmer for 10 minutes. 4. In a large pot, melt butter. Once butter is melted throw in bacon lardons/pancetta and diced onions. 5. Saute in butter for a few minutes until onions are translucent. 6. Next, pour in dry Arborio rice and stir until rice is coated (stir for about two minutes). 7. Pour white wine over the rice mixture, stir for another two minutes over a medium heat. 8. Then, begin by pouring soup mixture, one to two cups at a time. 9. Toss in your colorante alimentario/saffron and salt & pepper to taste. 10. Stir rice until mixture begins to look absorbed. 11. Pour another one to two cups of soup into mixture and stir until absorbed. 12. Repeat until all of the soup is gone and rice looks creamy. 13. Remove from stove and stir in the pureed butternut squash until combined, then add the roasted butternut squash cubes and Parmesan, and mix until evenly distributed. 14. Stuff your face and prepare to make this dish a staple of your cuisine.